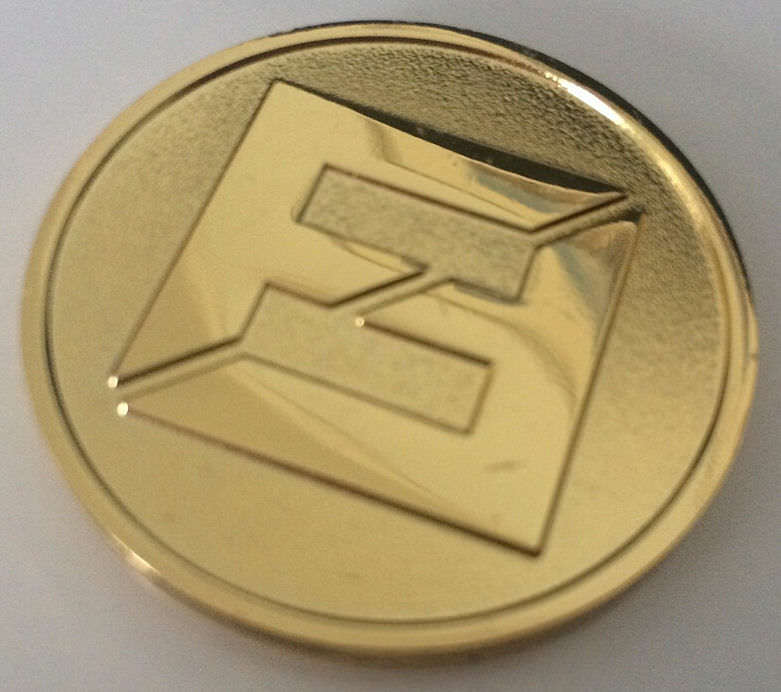 OK - so a thread on the coins was started over in check out my foo, but there really needs to be one here to keep track of them for the collectors. 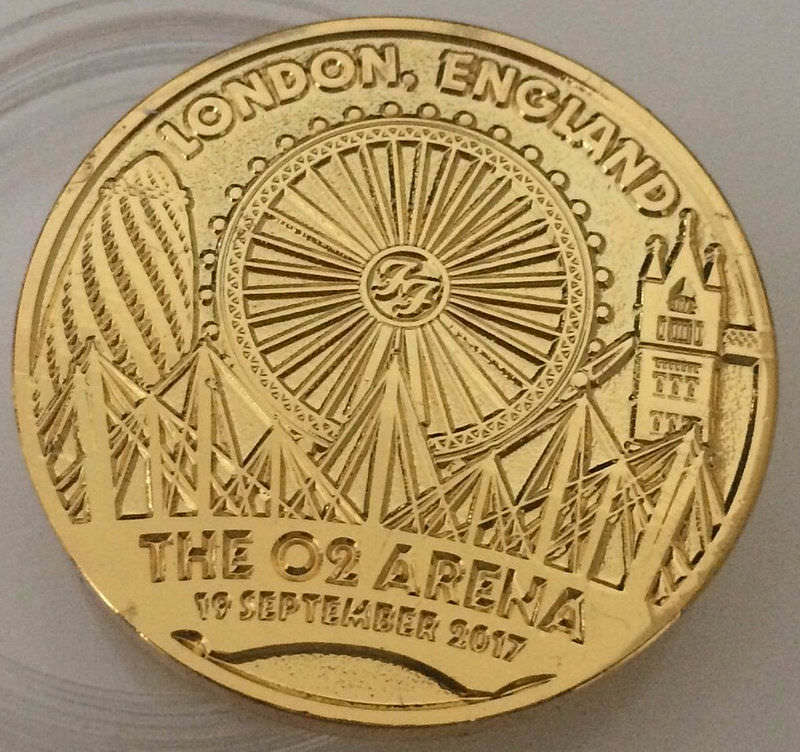 Note 1 One coin for O2 UK is the ONLY one created for a gig outside the US. There were no others in the EU, Mexico, AUS/NZ or South America. Note 2 Coins have been minted in two sizes. Mostly 1.5 inches in diameter six have been 1.25 inches in diameter (bolded). 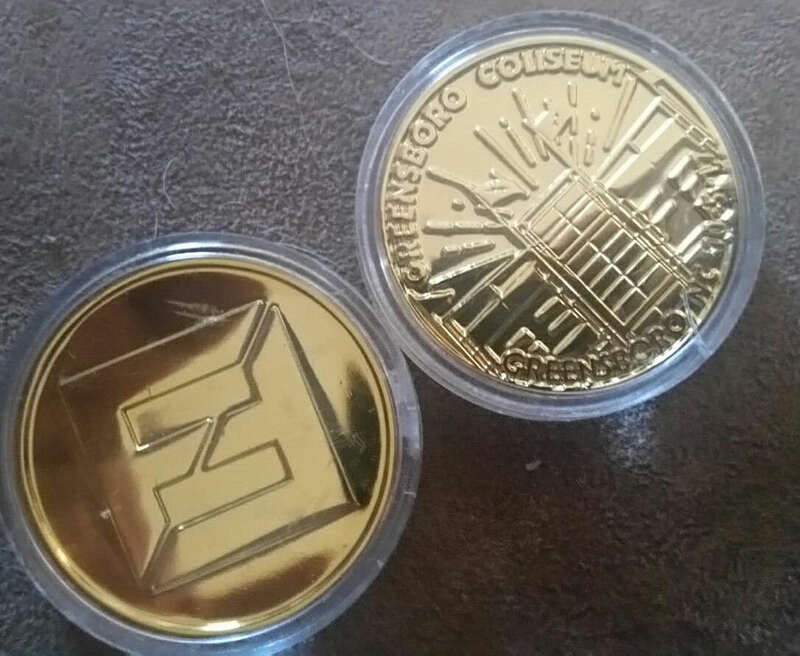 Note 3 Coins have been distributed in two formated. Mostly in a 1.5 inch plastic case but a few came in a small plastic bag. Last edited by FooZealand : March 11th 2018 at 08:51 PM. Last edited by FooZealand : November 7th 2017 at 12:20 AM. Last edited by FooZealand : November 7th 2017 at 12:17 AM. I'm just thinking out loud here. 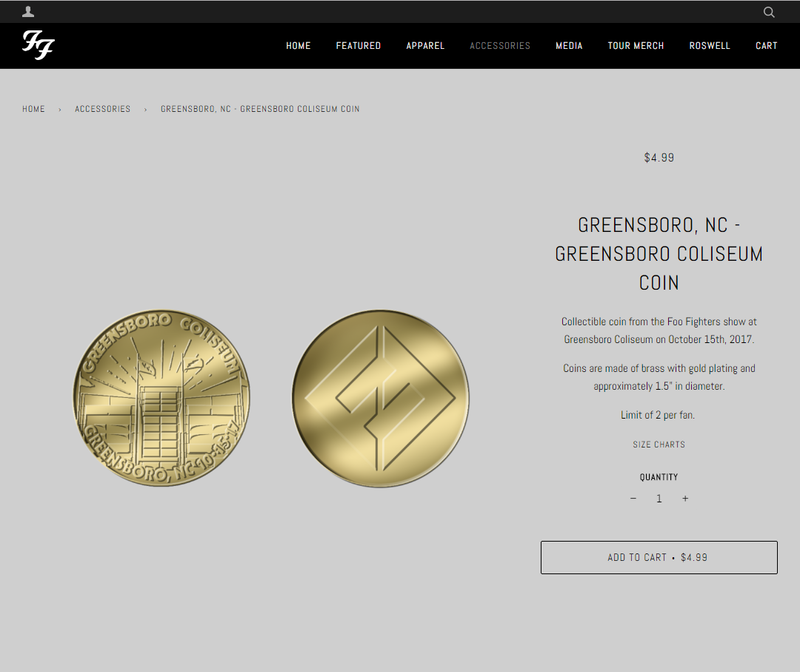 The FF US store describes only the Metro coin as a "limited run of 300 coins." 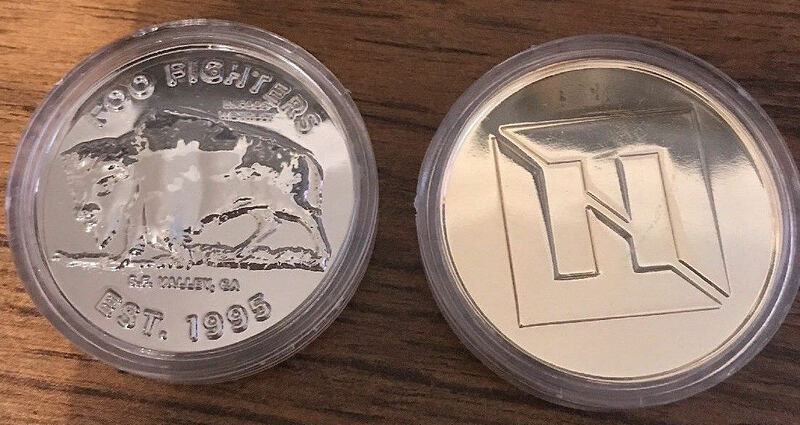 I wonder if LiveNation included this numbered detail in the description as it was one of the first coins to be released, so "LN" would want to give a detailed description, and as more coins released - they just put less effort into the descriptions? 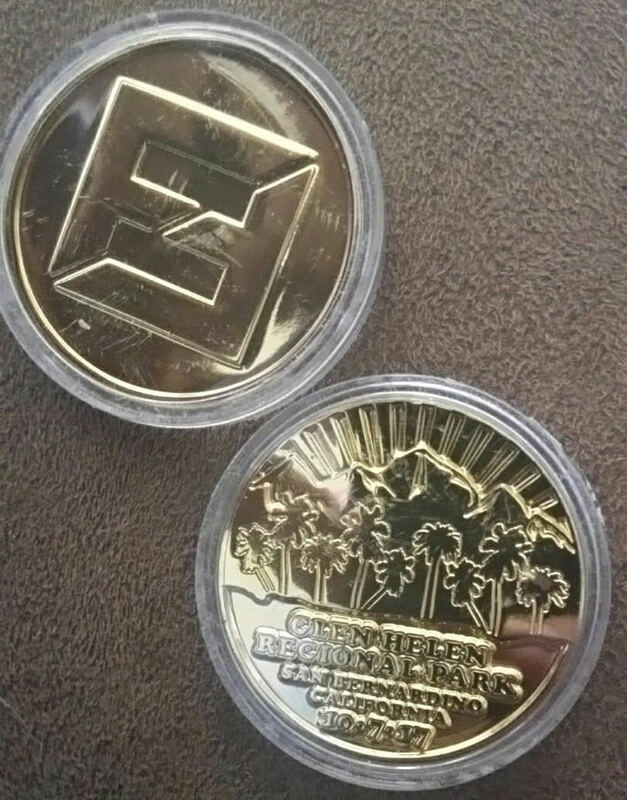 Or are all coin designs limited to 300? Or was it limited to 300 coins because it was such a small venue and other coins are made to suit the demand for the venue capacity? 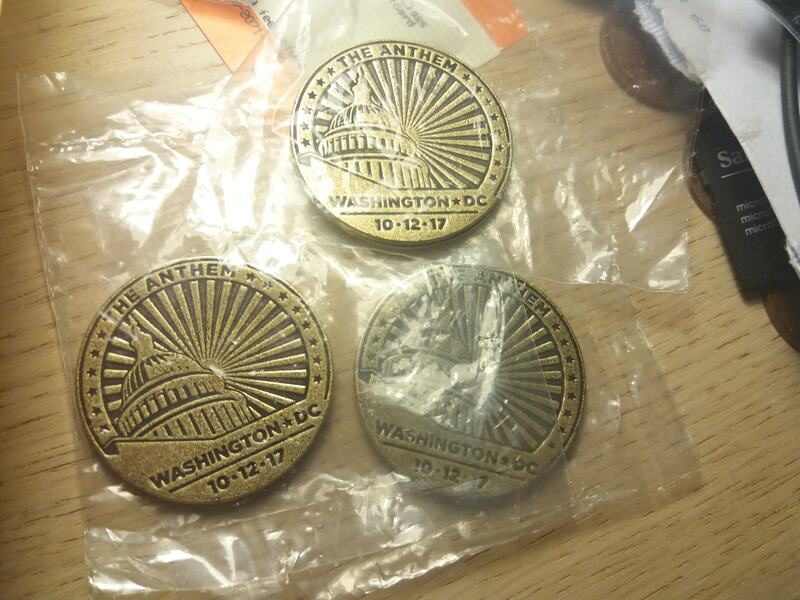 I think it would be nice to know a production number on each coin. Yeah you're asking all the right questions - all the possibilities you suggest are exactly where I end up too. 300 may only relate to the Metro gig because it was so small, or LN could just not be adding it to the other ones sold because they forgot, or they don't know the number, or that there isn't a number just in case they decide they'd like to press more. But I think there most likely IS a limited number for every pressing. The store has a "2 per fan" limit on ALL of them, and that is now being hard enforced in the cart. 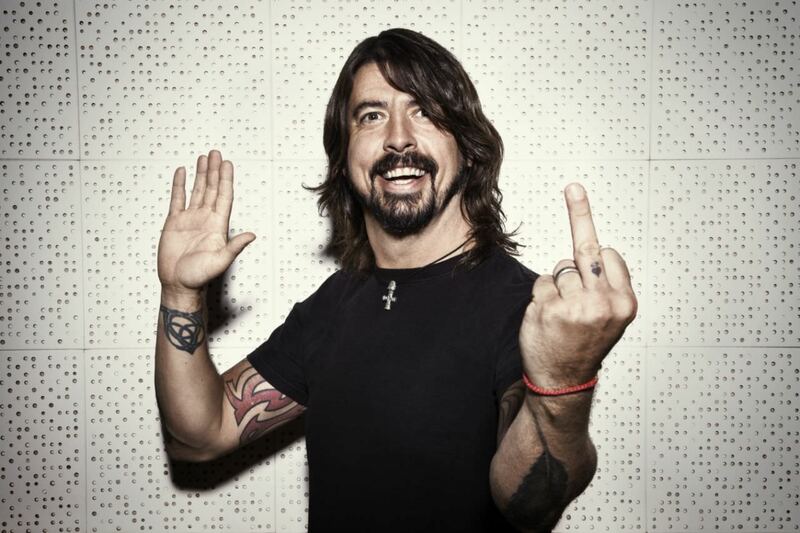 I think the number probably varies - CalJam would have had more etc. What's now the most interesting is that there could well have been TWO coins for several or even all of the full gigs. One variant sold in a sealed bag and one sold in a case. 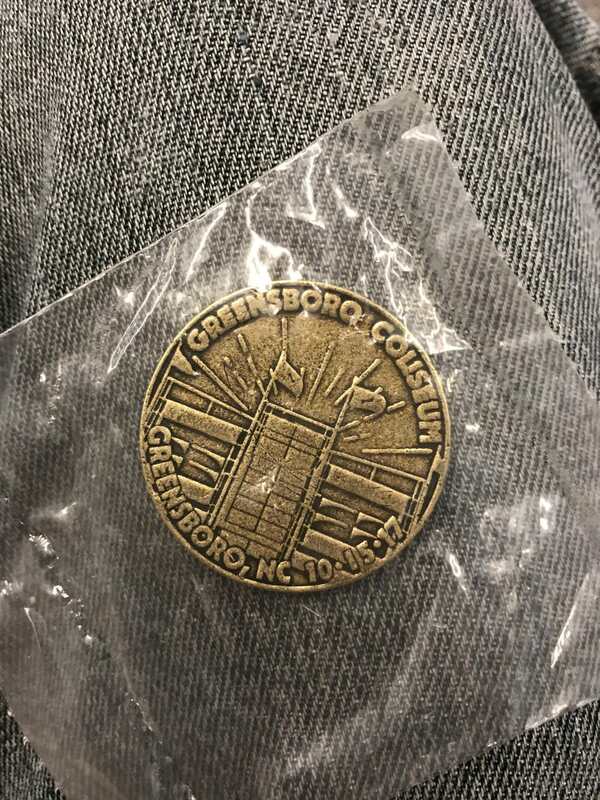 Greensboro (confirmed) and Anthem (looks 90% likely). When the store Anthem ones ship we will know for sure. 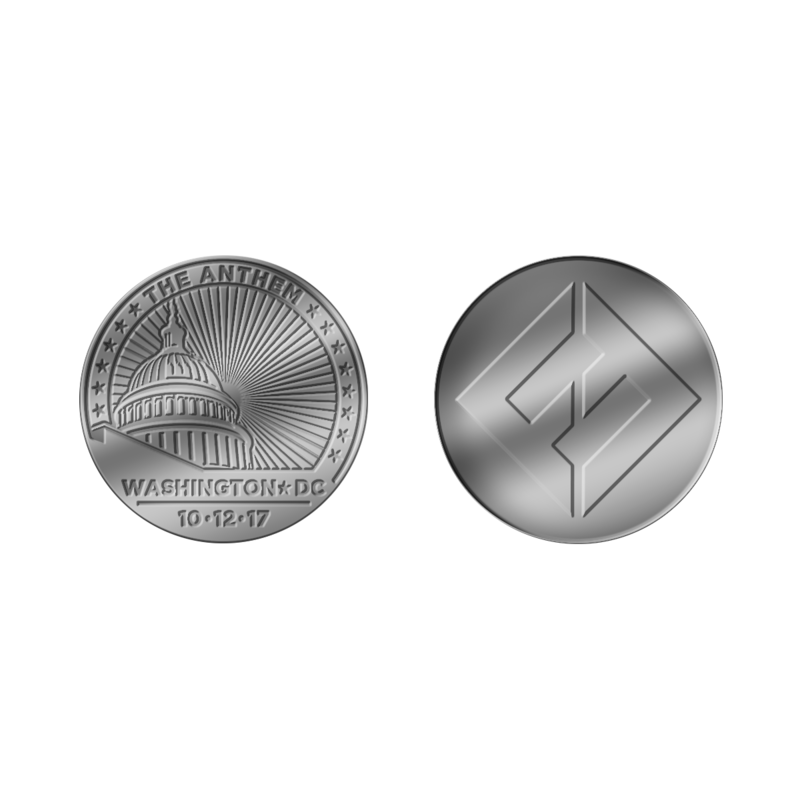 "...and when you align all 606 coins with their individual correct azimuth plus latitude and longitude, at the right time on the right day, the sunlight that is reflected will paint this very special picture in the sky!..." Could the white be a trick of the camera or was there any description with the pic from the owner? 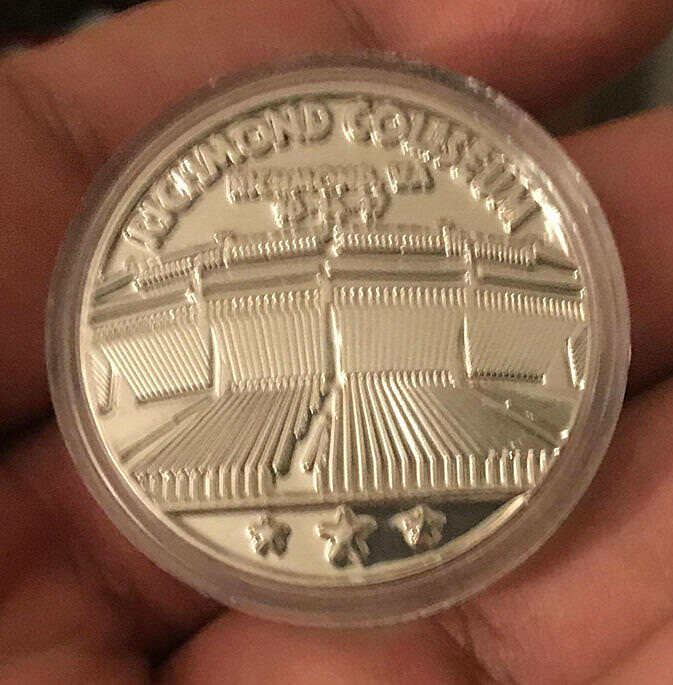 I was talking with the owner of the Knoxville bi-coloured coin and i commented that it looked copper and silver, but he said it was gold and silver. 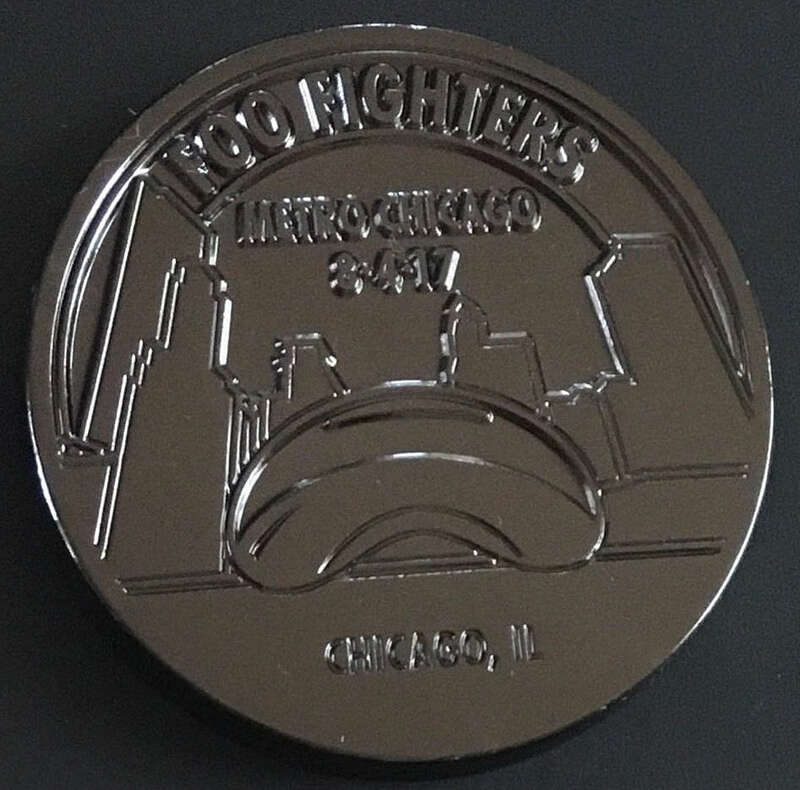 Wondering if there is a run of 300 per show considering the lack of coins available on ebay if there were a load more made for each show? Last edited by aprilshack : November 7th 2017 at 05:43 AM. 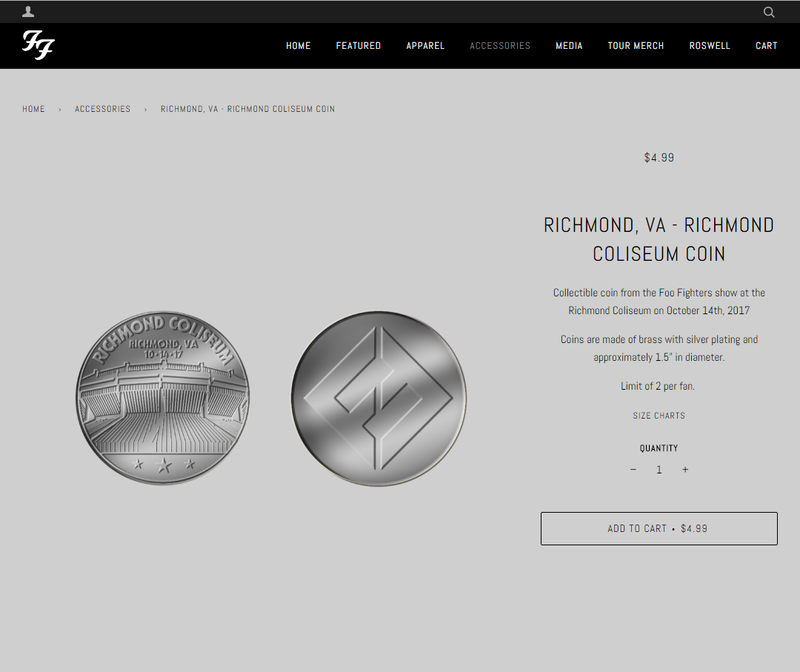 Is that Richmond VA one Gold or Silver? Can't tell from the image. 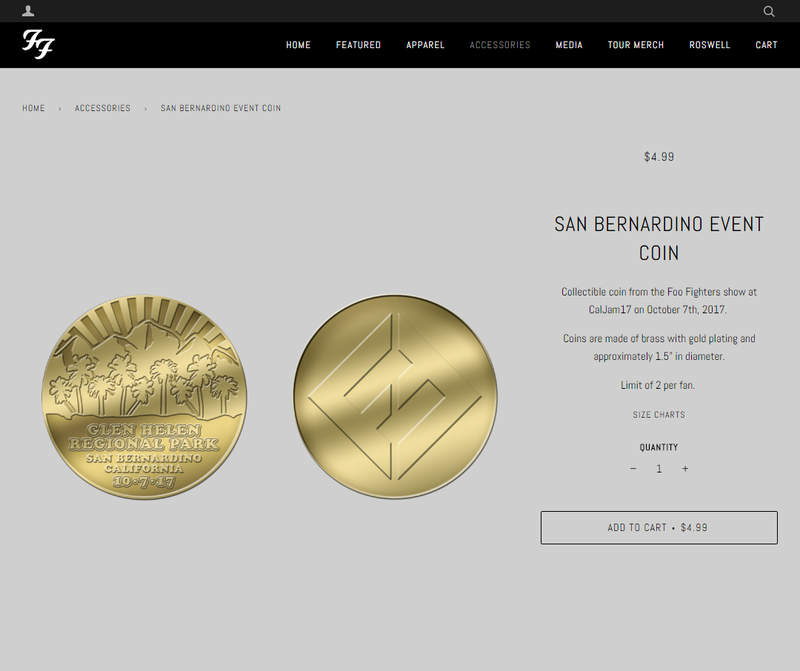 As there are silver ones on the store. 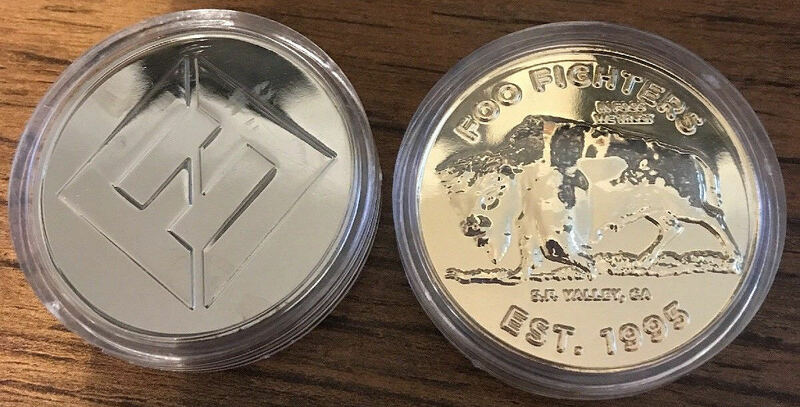 Got: Foo C&G coins, London, CalJam, Anthem Gold. Awaiting: Anthem Silver?, Richmond Silver, Greensboro Gold (unsure if bag or case) - (all from store). On lookout for: Metro (can't find any anywhere), Greensboro (other version), South Carolina, Cincinnati, and Knoxville ones. Feel like it is going to be a big effort to try and collect them all but going to give it a go... Metro one is very elusive now. 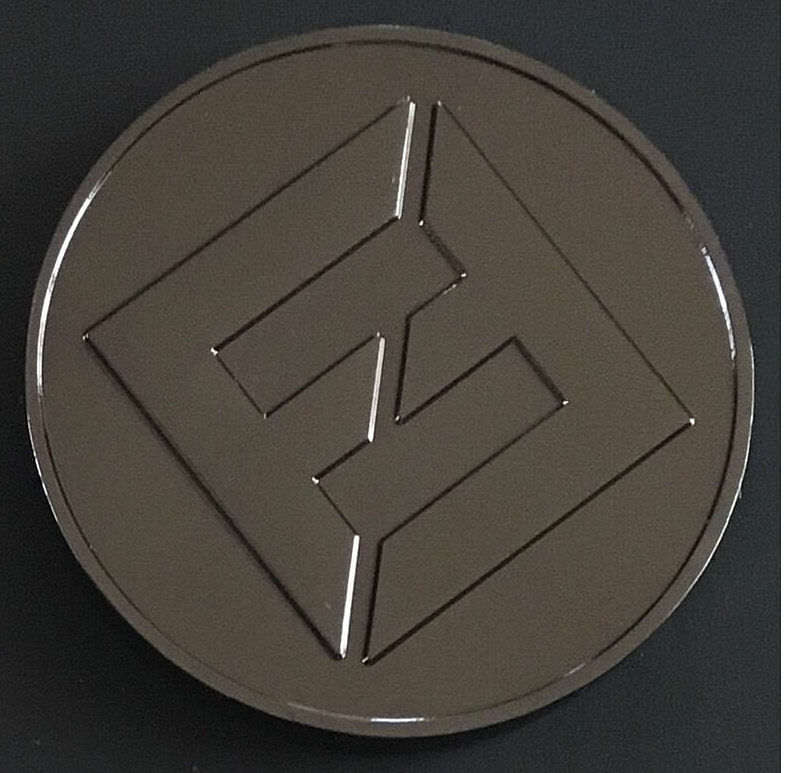 Noticed why some things don't appear on my searches.. some don't offer international shipping - like this coin (where I assume you took the pictures from). Found it on .com, but can't even message the seller to see if they could use the ebay shipping programme like with other things. Only mentioning it here as I realised this was one of the things that will never appear on my search. 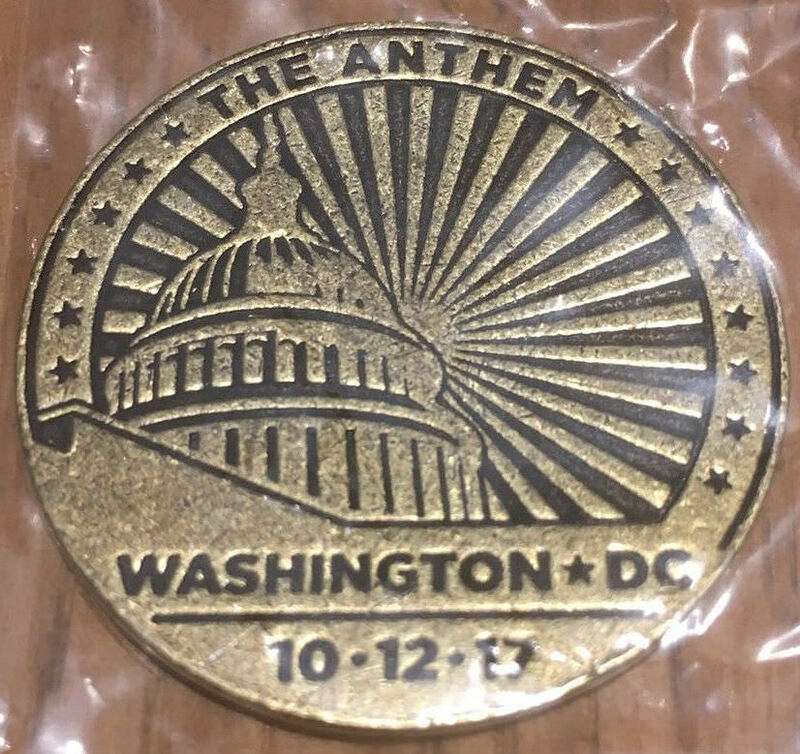 Update: the Anthem coin being sold on the store is the same as the one from the show, it arrived today. So the listing is wrong. *Unless there are proper silver ones but just they had some of the show ones left (unlikely in my opinion). 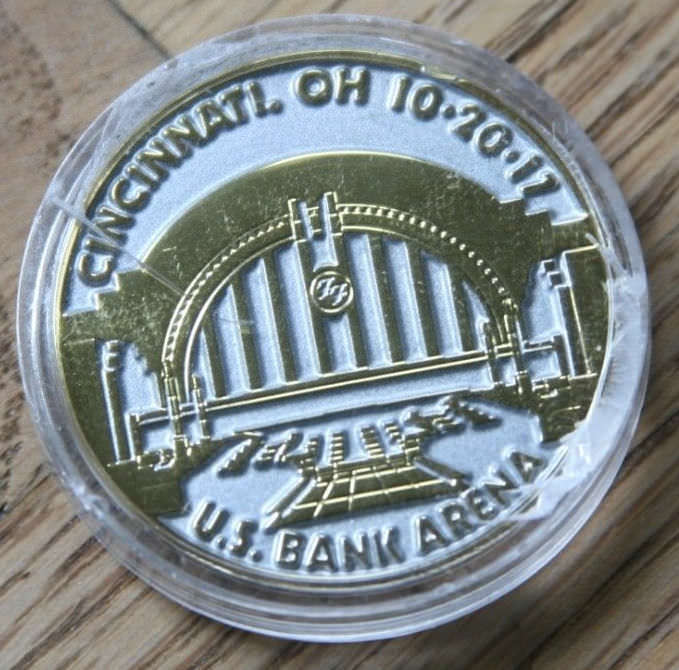 Judging by completed listings the Cincinnati coin isn't painted white, it's all metal coloured. 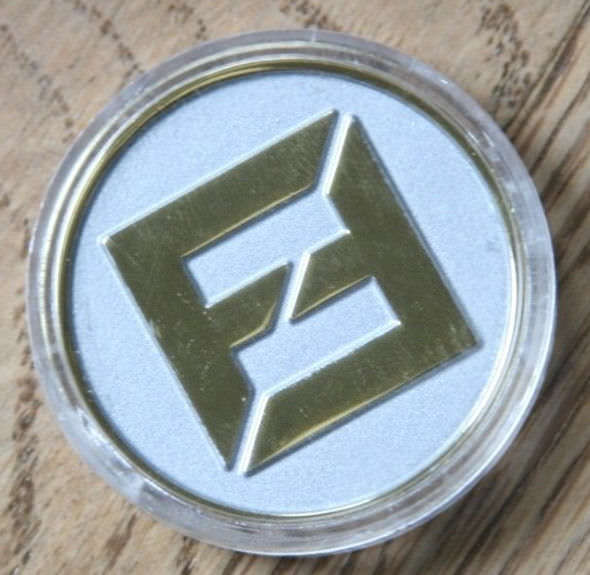 So it gold and not at all like the store image? Was it in a bag or a case? 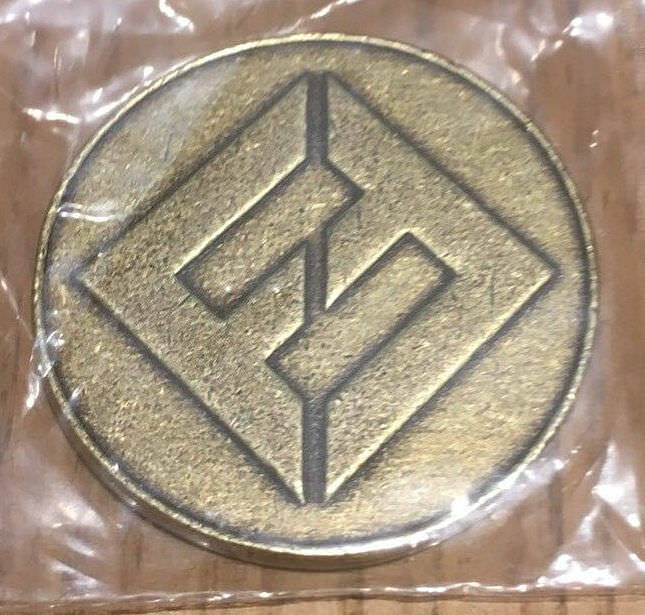 Collectible coin from the Foo Fighters show at The Anthem on October 12th, 2017. Coins are made of brass with silver plating and approximately 1.5" in diameter. US and UK shipping agents as well as my NZ final destination. That Virginia image is Gold and in a case. So yes the VA store one is possible also messed up. As you said here (at that time) you has Anthem Gold and were waiting on the store Anthem. And then the store one arrived right... so is the final result that the two both match exactly? And was each in a bag or a case? What Im really trying to get to is proof that the coins in a bag vs in a case are exactly the same or different. 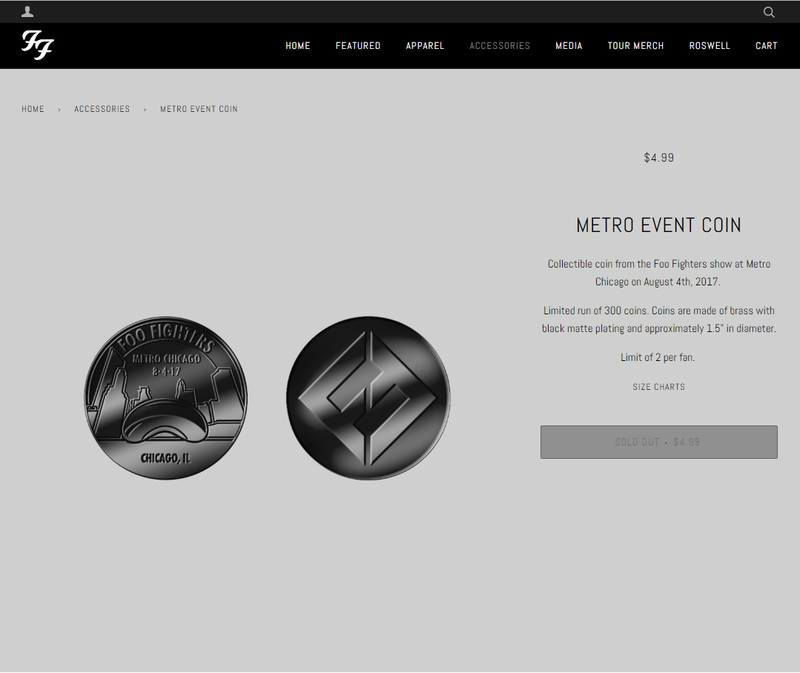 Noticed the Metro coin is still on the store (sold out) under accessories. So I figured with all the possible mismatching of detail going on I would also capture the store pages just for reference. I got one from ebay that arrived yesterday, and I ordered 2 from the store which conveniently arrived today. They were both in bags like the one from the show that I got (image below). All 3 shown together for convenience. Apologies if its bad quality, 11pm and on the phone and all that. I need me a US shipping agent quite possibly for stuff like that and other things that I have probably missed... but that can wait for another time.